It’s quite possible that my boyfriend is the king of lame dad jokes. Seriously – he seems to come up with new ones daily! I’ll never admit this to him but most are quite funny. It’s better not to encourage him though or I’ll be listening to punny jokes all day long. Although the 3 older boys (13, 15 & 17) and I roll our eyes at his jokes, my 7 year old howls with laughter. Give him a few more years and he’ll be rolling his eyes with the rest of us. Ha! 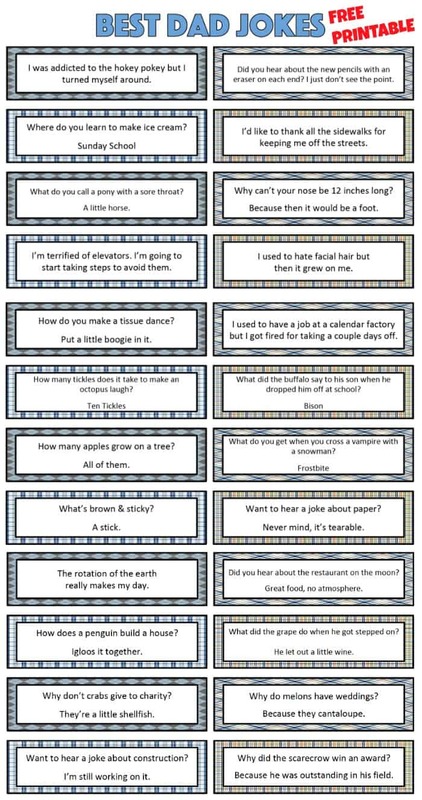 If you have some dad joke fans at home (or a dad in need of some new material for his comedy act), we’ve created this free printable of Best Dad Jokes. Why can’t a nose be 12 inches long? Because then it would be a foot. How does a penguin build a house? Igloos it together. Why do melons have weddings? Because they cantaloupe. What did the grape do when he got stepped on? He let out a little wine. See what I mean? These are so lame that they’re funny. Ha! So feel free to use this free printable of Best Dad Jokes as funny notes for your child’s (or husband’s) lunch, as part of a DIY Father’s Day gift basket, or even memorize a few to embarrass your kids when you’re carpooling their friends around to sports practice. Do you have a great dad joke? Let us know in the comments below – we can never have too many! Visit our Father’s Day page for even more fun ideas for the special dad or grandpa in your life. Stay updated on the latest ideas for family fun by following us on Facebook, Twitter, Instagram and Pinterest.